The idea for this side dish came from Susan over at Susan eats London. It’s hardly a recipe, just French breakfast radishes split in half and sautéed in butter and olive oil. French breakfast radishes are elongated, rosy-colored radishes tipped with white at the root end. The French adore them. You see them everywhere, but I can’t recall ever hearing them called breakfast radishes in France. No “radis petit-déjeuner.” No “bweakfast wadeeesh” either. The exact reason for why they are called French breakfast radishes is unclear. From what I can find out, their name has nothing to do with the French having them for breakfast. Instead, it comes from the Victorians who liked to eat them for breakfast or afternoon tea. “French breakfast radish” is the blanket term for any small, oblong, pink and white-tipped radish. These kinds of radishes were considered French because of their association to the French from the English perspective (the English observed that the French liked to eat a lot of them). They became known as those French radishes that you had while sipping your English breakfast tea. French breakfast radishes are the quintessential radish for slathering with good soft butter and dunking in flaky sea salt. They are also delicious sautéed in butter. Cooked, the radishes lose their bitter bite and they turn into succulent butter bombs. 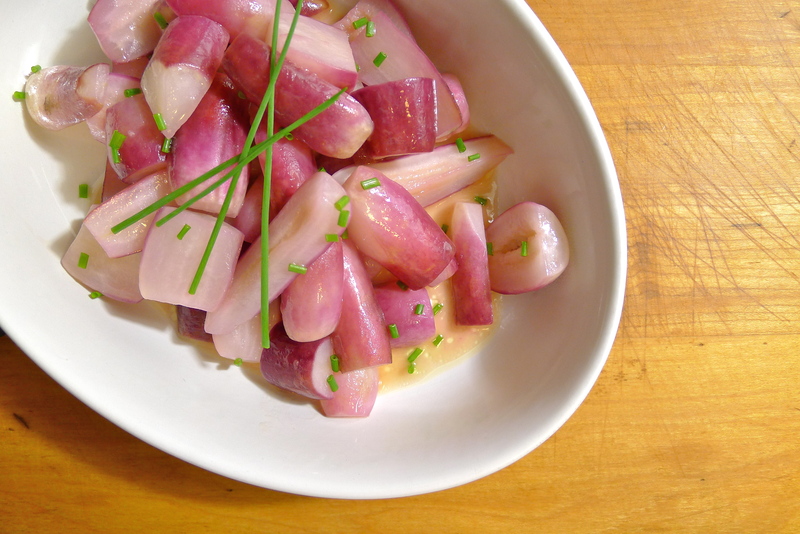 During cooking, the radishes give up some of their essence and make the most beautiful pink-hued sauce. They are impossible to resist. Susan calls them food crack, and who can resist food crack? Not me! 1. In a skillet large enough to accommodate all the radishes, melt a big knob of butter with a little bit of olive oil. When the butter begins to foam, add the radishes. Season them with salt and sauté them until the radishes lose their opacity and they all begin to turn translucent. Transfer the radishes to a serving dish and snip fresh chives over them before serving. I love this, of course. Sometimes I cook some baby turnips in there, too! I learn so much from you. The Welsh Rabbit, lopping off faces of foods that might squirt me in the eye and now the french radishes. My uncouthness is showing. They look really tasty and anything you get to dunk in butter and sea salt sounds like heaven right now. All joking aside, you are the least uncouth person I know! I have learned so much from you too! Which is why p90x is kicking my buttocks right now…Oh heavy cream and butter, how I love thee! Me too. I love them so much that I sometimes worry about gout . . . ! I have never seen this kind of radish here in New Zealand. I think if I were to grow my own though, the kind you can’t get in shops would be priority. Definitely! That is the best reason to grow things yourself. My grandfather has a bunch of Asian vegetables in his garden because he has difficulty buying them. You might not be able to get the fruit or vegetable at your market, but you can always plant the seeds! Very simple but very elegant looking presentation. I am hoping my wife will grow some radishes this summer! I hope she does too. I can only imagine how good radishes fresh from the garden would taste. Butter bomb? Food crack? Sign. Me. Up. I know, right? When Susan said they were food crack, I knew I had to make them that night. What an endorsement! I have had these while traveling in Europe but I haven’t seen them here in New England. I wonder why . . . maybe the weather? I get mine at the farmers market. Maybe we don’t get them at our regular supermarket here. I’ll have to remember to look. I lived in northern VT and grew very tasty French Breakfast Radishes. If you have a small bit of land they are pretty easy to grow and they grow fairly quickly. It’s definitely worth the effort. They were so good. I can’t believe that it took me this long to figure out that you can sauté them too! It just makes me start thinking about more possibilities. Like throwing in pea shoots, or snow peas. Yummy! Daisy, so simple and absolutely gorgeous! They sound divine :D.
Thanks, Nick! I love them. They turn into succulent little butter bombs — and who doesn’t love another vehicle for butter? I adore the “radis petit-déjeuner” even if they’re just plain old radis en français. And we get lots of them at our farmers’ markets. I like them cooked, too. It’s just that I like them better raw so I seldom have any left over for cooking! So true! I feel the same way about most everything I get at the farmers market this time of the year. I just got snow peas but will probably eat them all raw before they make it into any dish. Same with strawberries, or really any berries. * I am speaking in nautical-ese, not calling you names. I know! I was at the farmers market this morning and sadly, breakfast radishes seem to be on their way out. There were only a few sad bunches and the radishes were a little pithy. I did have a lot of them before the end though. And still wanted more! Turnips are starting to come in though! And that is a great idea to sauté those and serve them on top of their greens. Will do and report back, Cap’n! Sauteed radishes are very, very nice. Well done. Thanks, Rosemary. They were awesome! The thing that really drives me crazy is how pretty they are. I always see them–gorgeous varieties like these or watermelon radishes or those pretty ones with the pink and white stripes–and I think they’re so lovely that I just want to slice them up and devour them raw. And then I eat a raw piece of radish, and no matter how beautiful it is, the spicy bite just doesn’t sit right on my tongue. I feel that way about some foods too! Like small oily fish. Even fresh, like mackerel or sardines, I can’t quite get over the oily fishiness. They looks so silvery-skinned and pretty though. And everyone talks about how good they are for you and how they are sustainable. I just can’t do it without gagging a little. And don’t get me started on those little bones that people say dissolve. They don’t. Or at least mine don’t 😦 I wish I liked them. I’ll admit, the bones are a little weird. Less so in anchovies since they’re so tiny, but I do have to pick them out sometimes when I eat a sardine. I wish I liked radishes! Also, raw onions, raw mushrooms, and homemade mayo/aioli/remoulade/etc. (which I can stomach if it’s mixed with something, but still just can’t dip a french fry in). Awww. We all have our things! But the boy won’t eat broccoli or cantaloupe. So strange…. This looks so lovely, I’m going to try and hunt down some seeds for these beauties. I’m embarrassed to admit it, but I never thought of radishes as something to get excited about until your recent flurry of radish related posts. Thanks! It’s true: I ate a lot of radishes this season 🙂 But they were so delicious, and I bet they would be even better if they were straight from the garden. I hear that they grow pretty easily too, so if you give it a try, I can’t wait to hear how it turns out! Ahhhh! Thank you! You just reminded me of the small bag of radishes I bought at the farmers market on Sunday! They must be hiding under all the greens! I’ll definitely use this recipe. Oh, you are lucky! I wish I had some hiding in my fridge! So simple, yet so addictive! Just pulled a bunch of french breakfast radishes out of my garden, had some salted on a bit of butter slathered toast and then looked at my pile and wondered…besides giving them away to the neighbors, what on earth am I going to do with all these?!?! It’s always nice to have another option for breakfast radishes 🙂 Do let me know what you think if you decide to sauté them! Thanks for the comment and thanks for dropping by! French breakfast radishes are elongated, rosy-colored radishes tipped with white at the root end. The French adore them. You see them everywhere, but I can’t recall ever hearing them called breakfast radishes in France.